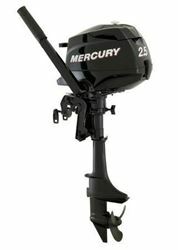 From time to time we have various deals on Mercury outboards ranging from the smallest portable motors at 2.5 HP all the way up to 350 Verado and Mercury Racing 400R's. We get specials due to our Platinum Dealer status and also occasionally come across floor models, show models, etc. that we get at a discount. Browse our current outboard specials below. If there is something you are looking for and can't find, feel free to contact us and we'll get right back to you! NEW Mercury 1F02201EK 2.5 HP FourStroke portable, tiller handle, manual start motor. Short (15”/381mm) driveshaft housing. Easily portable at only 54 lbs. See specs below. Brand new Mercury 1F03201EK 3.5 HP 4 Stroke small outboard tiller handle engine. Manual start, short shaft (15”/381mm) driveshaft housing. Tiller handle steering. Easily portable at only 54 lbs. See complete specs below. Mercury 1FX6201EK 6 HP Fourstroke Outboard Motor. Manual start, short shaft (15”/381mm) driveshaft housing. Tiller handle steering. Easily portable at only 57 lbs. See complete specs below.